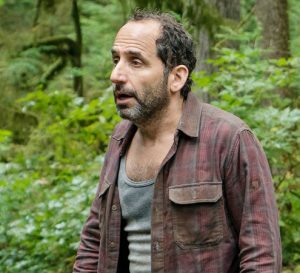 I have a lot of thoughts about last week’s episode of Colony on the USA Network. But I guess I better get the big stuff out of the way. I’m sorry, I can’t call it a Click. That just sounds dumb to me. We learned last season that humans identified some kind of signal as early as the 1970s, and it appeared that there was something visible on the Moon at that time, as well. One of the men in the room (a man with a German accent, if I remember correctly) was saying that they had to send a response. So, we’re supposed to understand that the preparation for the arrival had a much longer lead time than was apparent to the general population. Not all of the humans who were “in the know” were Americans. It might be safe to assume that a majority were not American, since the headquarters for the Global Authority seems to be located in Europe. Certain groups were not included — soldiers and special ops service men were actually wiped out if they didn’t hide their identity well, as Will and Broussard did. 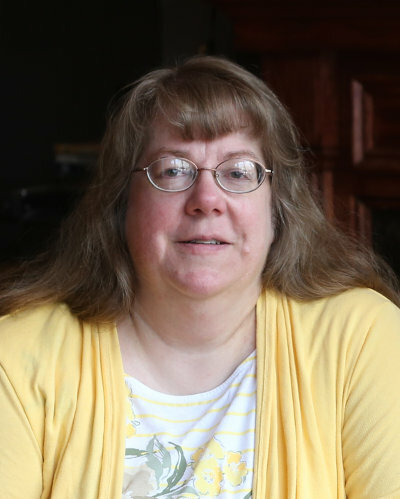 A few ex-CIA officials, such as Phyllis, managed to escape that fate and actually be put in a position of power, but we’re not sure how that happened. It’s clear Broussard’s position as a Red Hat was gained using a fake persona and not his real background. I further think that only a small number of the people we know as collaborators were in on this secret. This would include the Swiss Chancellor woman we saw last week, the one who told Helena that the time we have to prepare for the arrival of the main force of these new aliens was “Not long.” And at some point, probably when Helena was made Governor General, she was read in to the secret as well. But I don’t think Snyder knows, and I don’t think Phyllis knew. I think people like Snyder and Phyllis were motivated by a combination of desire for position and power and a desire for comforts (or, in Phyllis’s case, her husband’s care). So it would follow that Nolan and Alcala also didn’t know. So what it boils down to is a small number of humans sold out the rest of the human race, either for their own personal gain or because they believed it was the only way to save our species. What we don’t know for sure is, what is the truth? Let’s assume the RAPs are definitely threatened by this other race of aliens, but we don’t know if it’s true if this other race is also a threat to Earth and the earthlings. I think I’ve come up with a real question, or maybe it’s a big plot hole. Here it is: What happened to the captive RAP’s original gauntlet? I thought I knew the answer to this, but that theory depended on the original story we were told, that the RAP was a defector. 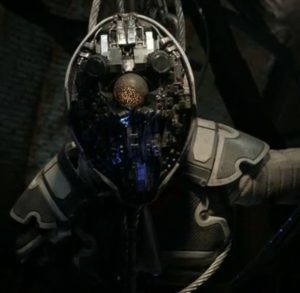 So, it made sense that the defector RAP would abandon its gauntlet before defecting, because it wouldn’t want the other RAPs to be able to track it. Just like someone destroys or throws out their cell phone when they go into hiding or try to run away or get burned or whatever might be happening in one of these spy thriller shows or movies or books. But this RAP was taken captive by MacGregor’s group. So what happened to it’s gauntlet? I have a more detailed theory about these gauntlets: they serve more than one function. 1. Communication; and 2. Tracking. Remember, BB removed some part from the gauntlet before he succumbed to radiation poisoning. 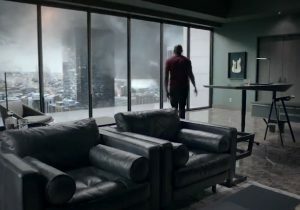 That part is the thing that Broussard, Morgan, Eckhard and BB used to lure a drone to the alleyway in their attempt to capture it during season 2, and it’s the same thing Broussard used on the roof of the Red Hand’s headquarters that alerted the drones to their location. We know the tracking aspect can be blocked if its put into some kind of metal container, and we see that MacGregor has his group’s RAP in a cage made out of chain-link fencing, much like Morgan, Eckhard and BB had in the loft. So the question remains, is MacGregor’s gang smart enough to know to use a Faraday cage, or could the captured RAP’s location be tracked? Obviously, they’re using one now, but did they have the RAP in a metal cage since they captured it? Are they smart enough on their own to know to do this or did someone tell them to do it? But it seems that the Transitional Authority, at least, doesn’t know this RAP’s location, because they sure seem to want Snyder to find it for them. At this point, I can’t come up with a scenario that makes sense. Either MacGregor is really in cahoots with the Transitional Authority, or this is a plot hole the writers overlooked. This is another question that’s bugged me since the beginning. And I’m starting to think I know the answer, at least partly. Snyder likes to make things up, and twist the truth to suit his purposes. For example, Snyder gives Nolan a document which is a plan of how the Seattle Colony dealt with its insurgency. Snyder claims the Governor General of Seattle was a friend of his. I think that’s a story; I think Helena gave Snyder the document and Snyder made up the story because Nolan would be more likely to use the plan if he didn’t know it came from Helena. 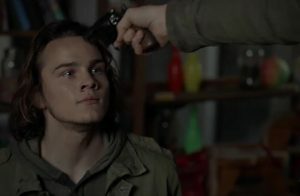 So, in the current season, what does Snyder know? Snyder immediately recognizes that “The RAP is online,” and even knows correct terminology to use (same as they used when the transplanted the round core thing from the RAP Katie’s group blew up into a new “suit” or body or whatever they’re called). Snyder has met a RAP. Snyder heard rumors about making bioweapons, but he claims not to know for sure if they were true. Does Snyder know about the second alien species and the danger they pose to earth? Does Snyder know why the drones are unwilling to kill Will? Does Snyder really not know where his daughter was taken, or does he just trust that Helena told him the truth when she said she put her name on the exemption list? Does Snyder know the RAPS are really not carbon-based life forms? I hope we learn more about what Snyder does and does not know. But based on how Helena calmly sat next to Snyder drinking and watching Nolan get launched into space, and didn’t tell him what she’d just learned about the imminent Total Rendition, it’s safe to assume Snyder doesn’t know everything. And also, Snyder will lead people to believe he knows more than he does when it suits his purpose. Are all of the RAPs like the ones we’ve seen? i.e., a robotic body with some kind of core where the intelligence lies, or are some of them actual carbon-based life-forms? The hull of the ship is made of hexagonal tiles. Whatever is inside is made of flesh and has at least 3 long skinny appendages that look like fingers (to clarify, they’re longer than human fingers but not longer than adult human arms). It’s hard to see much more details, though there was nothing that looked like human blood and nothing was moving. My question is, what group of aliens does this ship belong to? Something about the area made Amy almost faint. Strong magnetic fields can cause nausea and dizziness in humans, and some people are more bothered by them than others, which is why some people are more uncomfortable when they get an MRI than others are. The structure was constructed of large hexagonal shapes. My questions are, what group of aliens built this structure and what is its purpose? The RAPs are not carbon-based life forms, but AI. Whether they were originally carbon-based, or whether the RAPs we’ve seen were sent out from a planet by carbon-based life forms that created the AI beings, I’m not sure, but let’s go with the theory that the RAPs are AI beings and not alive in the sense of having flesh and blood. The other group of aliens, the enemies of the RAPs, is flesh and blood. The small ship the Bowmans found and the structure Broussard and Amy saw are made by the same group, the enemies of the RAPs. Here’s what I’m thinking: AI beings can’t really understand why it would be wrong to kill millions of humans and oppress an equal number of them. The RAPs, being AI, just want to preserve themselves and “win” over this other race. But if the other race is a race of flesh-and-blood, carbon-based beings, they may have more in common with us than the RAPs. So maybe the RAPs enemies would really be better allies for us than the RAPs. I have some questions about Amy. First we see her working in a hospital as a doctor. She is wearing the purple headband associated with The Greatest Day movement. Does that mean she was part of that movement or did she just go along with it to survive and keep up appearances? Then we see her watching the Total Rendition of the LA Bloc, so we know this happened about 6 months ago. Later we see her at her locker, seeming to make a decision about something. She picks up a necklace off the shelf in the locker and puts it on, and then tucks the end inside her shirt. To hide it? 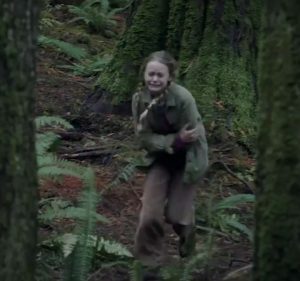 We see her helping an injured person who is presumably part of the resistance, but we don’t really know what led her to the role of “Dispatch.” She left the San Fernando bloc, the one that Broussard urged Claire and Owen to go to because it was safe. What motivated her to do that? 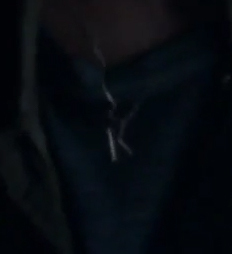 I found one interesting clue, but I don’t know what it means: the necklace she’s wearing when she and Broussard find that unusual structure in the middle of the night is a “K.” IMDB says her name is Amy Leonard, so there are no Ks in that name. Why a K around her neck? I’m hoping we find out more about her backstory. The resistance camp will blow up. We’ve seen footage of explosions and the Bowmans and other people with guns. The sneak peak at the end of last week’s episode shows Bram lighting a barrel on fire, a barrel that obviously contains some kind of flammable substance, if not explosive. Bram says “they’re building a bomb” and we see resistance camp personnel with bags of fertilizer, so they’re up to something. I bet the plan is to load something onto a train, using the crates with the stencils that Snyder was working on. My theory is that either the Transitional Authority finds the camp because something that happened when the RAP went “online” alerted them to its location, or maybe Snyder managed to get out into the woods and activate the beacon. Or some portion of the camps inhabitants revolt against MacGregor, possibly aided by the Bowmans. 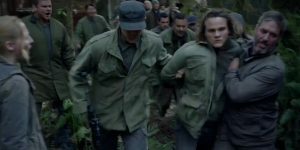 Some of the Bowmans get captured by the Authority, or maybe Bram is just being rounded up because he spilled the beans about the bomb. There have been a couple of shots that make it look like this happens. We get to see more of Snyder running in the woods and of Will and Katie looking tough and holding guns. “Colony” has struck me like a lightning: Three weeks ago I discovered seasons 1 & 2 on Netflix. Now I´ve watched them all, some of them twice. 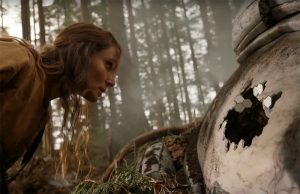 I have been a fan of intelligent science fiction for nearly 50 years, and “Colony” is more than science fiction to me: It is sociological and socio-political fiction at the same time, and it is far from unrealistic in these aspects – if you know humans. Fortunately I am able to watch season 3 on a US TV Channel in the Internet (even if it costs me some money), because season 3 will not be on German Netflix before the end of this year. I will not write down all my thoughts about the series, would be unreadable, but there´s one topic that just now I find most interesting: The period of time between the detection of the signal and the buildings on the moon (back in ´69) and the day of the arrival. You already wrote a lot about that field. In my imagination the preparations for this day were immense and must have taken decades. Maybe they recruited some of their puppets and proxies immediately before their coup (like Snyder, which really is not believable), but the majority of their personnel needed some kind of training, and they must have millions of people in their organisations worldwide: Administratives, scientists, their workforce, law enforcement and military personnel, normal people with simple occupations. Everything from university postgrad to unskilled labour. But not only those with leadership positions had to be trained for their jobs. Even if under Hitler stupid monsters without real formation could become SS-Generals. Same applies to other totalitarian regimes, but that does not work in a modern high-tech world. And what about all the other logistics: Cars, tanks, buildings, all the other equipment and hardware? And where did they hide the segments of The Walls (there must be billions of them! ), the ships and the drones! Perhaps on the moon? All of this must have been done in secret, and very thoroughly: On the day of the arrival the new organisation took over, and it must have functioned immediately. My own theory (so far, until next thursday): This could not be achieved without the former governments, agencies, organisations, law enforcement, secret services, military etc. being involved. Many of them took part in the preparations, and only those who would not collaborate were “wiped out” or sent to the factory. And on day Zero of the occupation they put on their new roles & clothing and started to function right from the start. Anything else wouldn´t work. Only the “normal” population of the Earth knew nothing. Only rumours and conspiracy theories, maybe, like it is the case in our own times in real life. This leads to another question, that you already mentioned: They must have told them something. Like Snyder, he knows more than he says, not all, but still a lot. But that´s another topic. So, enough for today. I am happy that there are other people who are touched by the series. Keep on writing!